Morning prep time: 3 minutes. Today we went to an event where there was Mexican food for everyone, but I've found it's wise to bring along a snack bento for Bug just in case the food is either late or too spicy for him. On occasions where I didn't bring something along I've sometimes been very sorry. 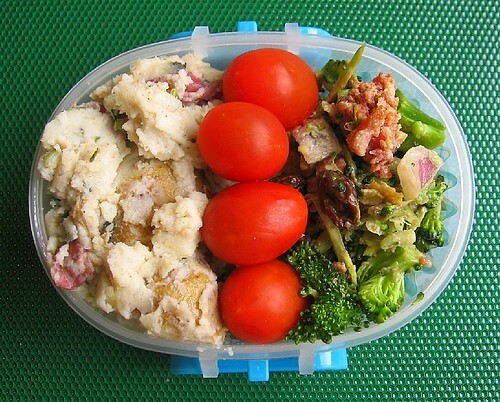 So I packed a 260ml snack container with some leftover broccoli salad some friends had brought over, cherry tomatoes, and homemade Indian masala-spiced potato salad with yogurt, cilantro, fresh mint, mango powder, cumin, and apple & rice vinegar. If you'd like to vote for my blog in the Blogger's Choice Awards (nominated for Best Food Blog, currently #10 out of 282 food blogs), click here (you can vote for for multiple blogs in the same category). I'm only 7 votes away from the #9 slot and the top page -- breaking into vegan voter territory! Mango powder? What's it like? I love mangoes but the only ones I've tried are the fresh ones and the dried ones. I got mango powder for the first time a few years ago when I was on a real Indian cooking kick. It's interesting -- not as earthy as some other spices like cumin, but it definitely brightens up a dish. Thanks for the kind thoughts on the Blogger's Choice Awards; I've actually moved into the #9 slot (and the top page) thanks to everyone's votes!!! I can't tell you how jazzed I am to be on the top page -- that made my day. I'm normally not a fan of uncooked broccoli, but this salad was surprisingly nice (I think because the florets were broken up so small). I don't like uncooked brocolli either ^_^ but I'm not sure why but it just tastes really good with the bacon and other seasonings or whatever is in it (: I should good a recipe a for it. Thanks, nin! Thanks to you and everyone else who voted, I've moved up into the #9 slot and the top page -- woo hoo!!! Indian is the way to go! I kind of had to giggle at this. Thinking "Indian at a Mexican event!" But I find this so creative Biggie. Just love the way you spiced the salad up. Re: Indian is the way to go! Thanks Meeta! I didn't really think about the whole "Indian at a Mexican event" aspect, just grabbed what was handy and ran out the door. That potato salad sounds so good. If there's a recipe, I'd love to get it. I stumbled on your blog two weeks ago when I had no idea what a Bento was and now I'm hooked. You have some truly useful information and I appreciate all the detail and the lovely photos. Good luck with the Blogger awards. I made an account just to vote for your site! I kind of improvised on the salad, but I'll see if I can approximate a recipe for you. Thank you for the kind words, and also for the vote! Thanks to you and all who voted, I've just moved into the #9 slot and the top page -- woo hoo!